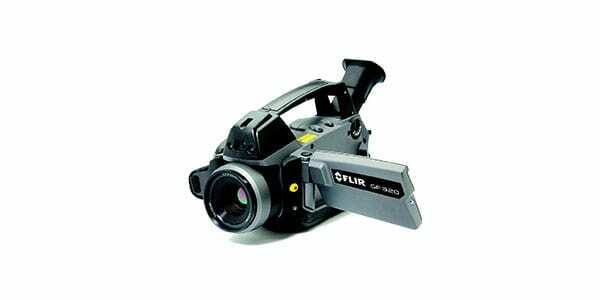 The FLIR GF 320 is a revolutionary infrared camera capable of detecting methane or volatile gases in real-time. This latest technology from FLIR can significantly improve work safety and regulatory compliance by giving inspectors a quicker and more efficient method to trace leaks to their source. The FLIR GF 320 provides more reliable performance than traditional “sniffer” detectors; gas leaks look like smoke on an infrared optical gas imaging detector. This easily identifiable feature lets inspectors perform a broad sweep of thousands of operating components to see and document gas leaks quickly and accurately. This incredible feature allows components to be safely tested during inspections without shutting down systems, leading to a safer environment and reducing revenue loss. This can also provide verification that a repair was successful in stopping a leak. The GF-series optical gas detection cameras can locate methane, benzene, and other natural gases. Accurately document and report problem areas with built-in features such as a video recorder, digital camera, laser pointer, and embedded GPS location data. FLIR offers several reporting software products to help make inspection reporting easier. 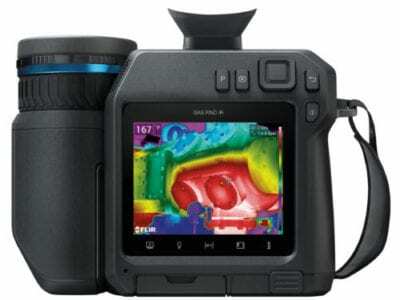 The FLIR GF 320 can be used in conjunction with the FLIR mobile app to wirelessly import images from the camera’s SD card and share them with your team. The Video Report desktop software is designed to edit recorded video to build movie reports. Reporter Pro lets inspectors build professional reports complete with measurements, Delta T analysis, and images.